I have to apologize for neglecting my blog but I haven't had anything inspirational to write about until today. My nose has been to the grindstone preparing for next month's schedule which includes a trip to Superior Threads in St. George, UT to teach for their School of Threadology.the day after I get back from there I fly to Providence, RI to teach at the amazing MQX show and then a week later I hostess my first retreat of the year in McCloud. My organizational skills as well as my sense of humor definitely come into play here! I have to publicly thank my family for putting up with me these past few weeks and allowing themselves to be neglected! "It is a queen-size quilt where I used an old linen table topper that belonged to my Grandma and layered it with pink batiste and a lace edging. The top is white sateen and the back is a white tone-on-tone. I also put some flat ribbon lace on the back around the middle section and then just a few Swarovski crystals as well. I've named it "Grandma's Blush". 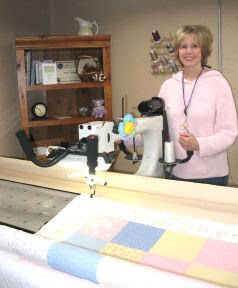 Cindy - thank you for picturing my quilt and even me! My Grandma was the person in my life from whom I've inherited my love of linens and all needlework. She loved to knit, crochet, needlepoint and make me Barbie clothes. She's been gone now for around 30 years but thank you Grandma and thank you Cindy for your inspiration!